Friday – EdgeArt Reviewed by Edgeville Buzz on May 18, 2011 . The Edgewater Chamber of Commerce has partnered with Edgewater Artists in Motion to present special art walks in the neighborhood showcasing and featuring local artists. Two walks will occur in 2011: (1) a spring EdgeArt Art Walk taking place on Friday, May 20th 6pm – 9pm along Granville and Broadway and (2) a fall EdgeArt Art Walk along Bryn Mawr. 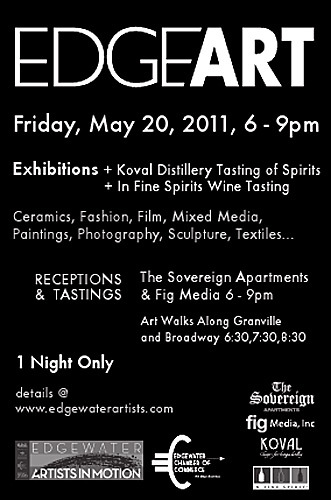 The Spring EdgeArt Art Walk event takes place from 6pm to 9pm on Friday, May 20th with a FREE public reception, featuring local artists and artwork at the Sovereign Apartments (1040 W. Granville) and at Fig Media (1120 W. Granville) as well. Participating businesses along Granville and Broadway will be opening their doors to showcase artwork. Volunteer tour guides will leave from the Sovereign Apartments throughout the evening to take you on a stroll to enjoy artwork in windows and inside shops and restaurants. Many thanks to Edgewater Artists in Motion volunteers Dorothy Mason and Jyl Bonaguro for all of their help in planning this event. Click here to read more and see a list of participating businesses.